The 50th Marine Measurement Forum (MMF50) was held in the Princess Royal Gallery at the National Museum of the Royal Navy, Portsmouth on 12 June 2012. It was hosted by the MMF Steering Group and, to celebrate the 50th milestone, took a slightly different approach to the usual MMF format. MMF50 provided an opportunity to reminisce about the history of measuring in the marine environment, to overview the techniques and equipment used today and ponder what might be in the pipeline for the future. The twelve presentations were given from different perspectives, emphasising the diverse nature of the marine measurement community. It was fitting that Colin Waters (ex HR Wallingford) and his wife Una, were guests of honour for the event as Colin was instrumental in ensuring the continuance of the MMF series during the 80s and 90s. The MMF opened with Roger Scrivens, RS Aqua Ltd and a member of the MMF Steering Group, reviewing the history of the MMF series which dates back, as far as can be determined, to 1983. The ‘Bob Cuffe Legacy’ was discussed. Bob, sadly no longer with us, was the founder of the MMF series and introduced the “no formalities, no high prices, no rules” creed by which the series had operated. Also much missed is Bob Barton who, as editorial contributor to the IOS journal, penned a somewhat sharp piece in the May 2002 edition arguing strongly against the ‘commercialisation’ of the MMF as attributed to MMF32. Whether Bob’s words influenced things or not is unclear but the two day format never re-appeared! A copy of the article was displayed at the meeting along with other items of memorabilia. Roger’s MMF review was followed by Versha Carter, Intelligent Exhibitions Ltd, who used her personal knowledge and experience of the Oceanology International and Ocean Business events to present a rather fascinating look back at how the ocean/offshore/marine exhibition scene developed in the 1970s and how influential David Stott was in the process. Dr Duncan Redford from the National Museum of the Royal Navy then gave a presentation on 1900-1914 Royal Navy ship naming policy and the first session was closed by Stephen Hall, NOC Southampton who predicted the need for more autonomy and data sharing to satisfy regulatory requirements. After a networking coffee break, Richard Johnson from ITOPF opened the second session with an informative presentation on oil spills. Key points were that the rising number of tankers plying their trade did not equate to a rise in oil spills, just the opposite in fact, and that despite technological advances, simple man power is still the most efficient mop-up tool. Richard was followed by Simon Partridge, Sonardyne International, who discussed the history of underwater acoustics. He reported that, in the early 1800s, the speed of sound underwater had already been determined and, astoundingly, was only 3m/s in error versus today’s accepted values. He also audibly demonstrated the rate at which data can now be transmitted acoustically through the water column. Prof Gwyn Griffiths, NOCS, then looked back at his personal mission in the late 1980s to open eyes to the extent of potential data available from emerging ADCP technology. He showed a 1986 data plot hand coloured to demonstrate the wealth of information hiding within the sound scattering data images. Father and son team, Charles and Matt Quartley, Valeport Ltd, wrapped up the second session with a “how it was” and “how it might be” look at the ocean equipment manufacturing industry. A first class lunch was accompanied by much networking, visits to the museum’s wonderful galleries, sightings of various historic naval ships and viewing of the historical equipment, photos and articles brought by attendees. Dr Ralph Rayner, BMT Group, opened the final session with a past, present and future review of the Global Ocean Observing System (GOOS) and was followed by Dr Kevin Black, Partrac Ltd, who looked at the enormous increase in data availability being derived from acoustic Doppler technology. Charlotte Marcinko, NOCS, demonstrated that the future of ocean research is in good hands as she brought the little researched field of bioluminescence to light. She illustrated eloquently how this research field in one where there is plenty of scope for future growth. Her presentation attracted interest from many attendees, with lots of questions being posed regarding the nature of bioluminescence and future research possibilities. The day’s concluding presentation came from Daniel Esser, Contros (Germany) who reviewed the burgeoning dissolved gas measuring sector with examples of how the technology has advanced. The standard format for MMF meetings will re-appear for MMF51. News regarding that will be published here on the MMF website, in International Ocean Systems journal and via OceanBuzz newsletter. 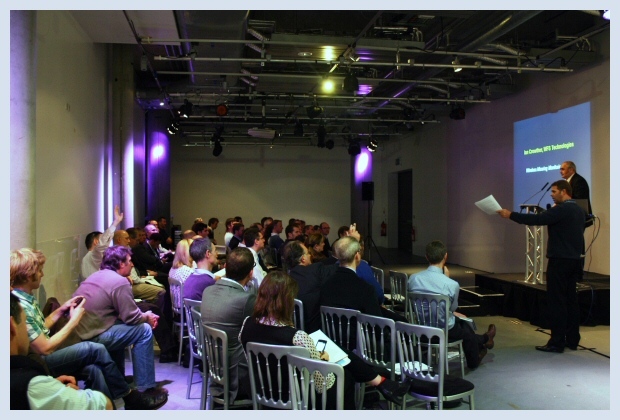 The 49th Marine Measurement Forum was held in the Glasgow Science Centre on the 9th November 2011. 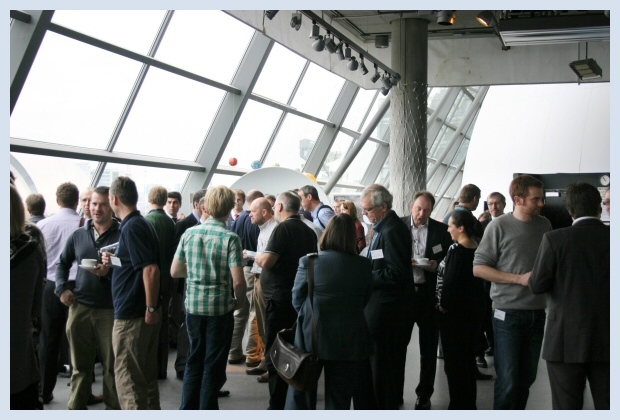 Hosted by Partrac Group, the event brought together the scientific measurement community to explore and share new technologies, project experiences, equipment evolutions and survey processes. Over seventy delegates attended from across the UK and further afield and from a diverse range of companies including offshore wind and marine renewables organisations, environmental and engineering consultancies, ports and harbours, government and research agencies, equipment manufacturers and survey companies. Dr Kevin Black (Partrac Group) opened the forum and introduced the morning speakers. Stephen Auld from CodaOctpous Products was the first speaker of the day and gave an interesting account of using high definition 4D sonar with augmented reality for real time positioning in the Rotterdam Port extension. Stephen was followed by Dr Richard Bates from the Department of Earth Sciences and Scottish Ocean’s Institute who discussed attaining oceanic measurements in Greenland to inform global climate models. Dr Keith Jackson from the Scottish Association for Marine Science (SAMS) ended the first session by explaining the difficulty in collecting data in tidal systems and introducing a low cost drifter buoy system which could acquire such information. After a refreshment and networking break, Dr Clemens Engelke from the Scottish Environment Protection Agency (SEPA) presented information about SEPA’s in situ monitoring network in the Scottish coastal waters. John Murray from the Society for Maritime Industries followed by discussing the Annual Review of UK Marine Scientific Industries 2011 and AMSI business survey results taken at Ocean Business 2011. John’s presentation gave a mainly positive account of the marine, science and technology sector in the UK. Andy Smith from Saderet gave an educational report of the evolution of ADCP technology and presented on the benefits and advancements of the newly released Sentinel V ADCP. David Goldsmith from RS Aqua closed the second session by discussing the research and industry collaboration SOOGUARD. After an enjoyable lunch overlooking the Clyde, Paul Taylor from Intertek METOC opened the third session with a presentation entitled, ‘Garbage in – Garbage out: Improving model outputs by improving model inputs’ and gave numerous interesting examples of previous project experiences. This was followed by Jim Elliott from SAMS who gave an engaging talk about capturing and mapping underwater sound in tidal stream sites. Roger Morris from Bright Angel Coastal Consultants spoke about post-construction monitoring and Ian Crowther from WFS Technologies discussed wireless mooring line monitoring. Dr Peter Hayes from Marine Scotland opened the final session by discussing the diversity of interest and accessibility to Marine Science data. Duncan Matthew of the National Oceanography Centre followed by presenting on the evolution of TOBI (Towed Ocean Bottom Instrument) for the modern era of deep ocean surveying – TOBI 2. Jonathan Taylor from HR Wallingford was the penultimate speaker and gave an enlightening report on the marine survey process with an emphasis on what can go wrong and how to prevent it. The final presentation was from Gunda Wieczorek, SEPA, who presented on hydrographic measurements of a tidal cycle upstream of the Glasgow tidal weir. For those delegates who did not have to leave early to travel home Partrac hosted a drinks reception at the Glasgow Science Centre which provided a final opportunity for delegates to meet, network and unwind.